We've tested out the new Firefox on an iMac and it is surprisingly clean and simple. It's extremely snappy when browsing the web and adding more tabs. Mozilla claims that it is twice as fast as Chrome, while using 30 percent less memory. We decided to run some benchmarks and speed tests between Firefox Quantum, Chrome, and Safari. We loaded each with a bunch of tabs and also ran a few videos at once to see how they'd perform. All browsers have their upsides with certain features that users love. If you're on a Mac, chances are Safari is the best choice, since it supports the rest of the Apple ecosystem, with added features like Hand-off and Safari Autofill which automatically syncs with your iPhone. That feature was recently revolutionized with Face ID on the iPhone X, with instant autofill without having to tap any buttons at all. We ran our tests on a 2017 5k iMac, equipped with the 4.2GHz i7 CPU, Radeon Pro 580 graphics card, 512GB SSD storage, and a total of 40GB of RAM. While running the benchmarks, we used iStat menus to monitor the process usage for each browser, and noted the maximum usage at any given time. The usage is displayed in relative percent, so it won't be limited to a total of 100% like the CPU sensor shows. High usage isn't always a bad thing, since it can just mean that it's well optimized, but it can also lead to higher CPU temperatures and a louder fan. If CPU usage is through the roof, then you should expect a big boost in performance, otherwise it's inefficient. We first ran Antutu's HTML5 benchmark. Firefox was a little bit behind the other browsers, but it used the least amount of processing power. Safari for some reason, used a huge amount. We also ran Jetstream 1.1. Firefox beat Chrome while using the same amount of processing power. Safari destroyed both of them, but was demanding. Running the Octane 2.0 benchmark, Firefox was right under Chrome, but used less power. Safari beat them both again, while using much more power. Firefox actually beat both of the other browsers in Speedometer 2.0, while using much less power. Chrome and Safari destroyed Firefox in Ares-6, while using not that much more processing power. Firefox gets completely mauled by the other browsers under the Motionmark test, and surprisingly, Safari actually uses the least amount of power this time. We averaged the maximum power usage for all of the tests and found that Firefox used the least, while Safari used the most. 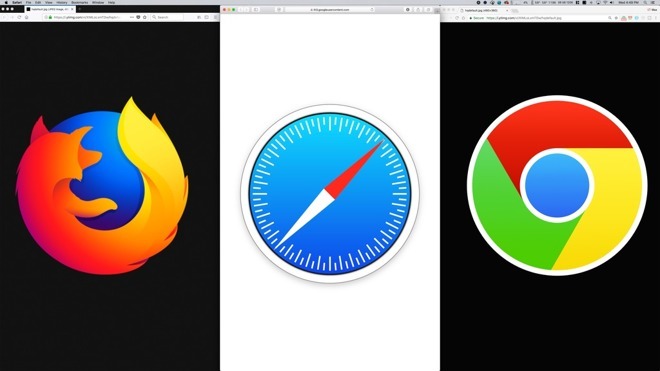 We don't blame Safari though, since it definitely outperformed the other two. We decided to run all of the benchmarks at once on each browser. The maximum process usage for Firefox was 540%, and the actual CPU usage sat at around 60%. The scores averaged around 34% slower while running them all at once. Chrome on the other hand had a maximum process usage of 735%, with around 85% of actual CPU usage, and the fan noise definitely showed it. The benchmarks averaged around 55% slower while running in tandem. Safari also had a hefty 716% maximum process usage, with around 80% CPU usage, so the fan kicked up, just like on Chrome. However, the benchmark scores averaged around 37% slower, which is still pretty good. We were extremely impressed with Firefox, being able to run all the benchmarks at once and only kicking the CPU usage to 60%. Our first test was to time how long it takes to open and load nine of the most popular websites. We got our stopwatch ready and ran through each set of sites three times for accuracy. Chrome destroyed the other browsers, with Firefox lagging behind. Safari was right in the middle. Now we decided to see how each browser would handle 20 different AppleInsider articles open in tabs at the same time. Firefox used the least amount of RAM, and we also found that Firefox only used one extra process for every five open tabs, while Safari and Chrome had an extra process for each tab. All browsers were snappy when switching between tabs, but Chrome was pretty slow to close tabs compared to Firefox. Safari was able to close tabs as fast as we could click. Chrome actually crashed and froze during this test. That isn't surprising, given Chrome's performance when users have loads of tabs open. For our final test, we decided to run five YouTube videos at the same time. While using Firefox, CPU usage was at a shockingly low 10 percent. Playback was very smooth, and the fan didn't kick up. There hasn't been much time to really test how well Firefox Quantum works for day to day use, but it's definitely off to a good start. It's also very clean and simple, just like Safari. In the end, it all boils down to which browser offers the best balance of features and speed for your individual use case.